Traditionally characterized by their Xs and Os, sports are increasingly being joined by the Xs and Ys of keyboards and game controllers. Whether you think of eSports as a real sport or not, eSports are a firmly entrenched aspect of global culture: poised to become a US$1 billion business by 2019, as well as a medal event at the 2022 Asian Games. China is the undisputed global eSports leader, but Canadians are also enthusiastic eSports participants. Our research found that about one-in-six (16%) online Canadians aged 12 and older – approximately 4.5 million people – participated in an eSports activity in the past six months. Watching eSports competition in real-time was the most popular activity, followed by watching recorded streams. More than two-thirds (69%) of eSports participants are male; the average eSports participant is 28.6 years old, with a household income of $78,000, which is above the Canadian average. 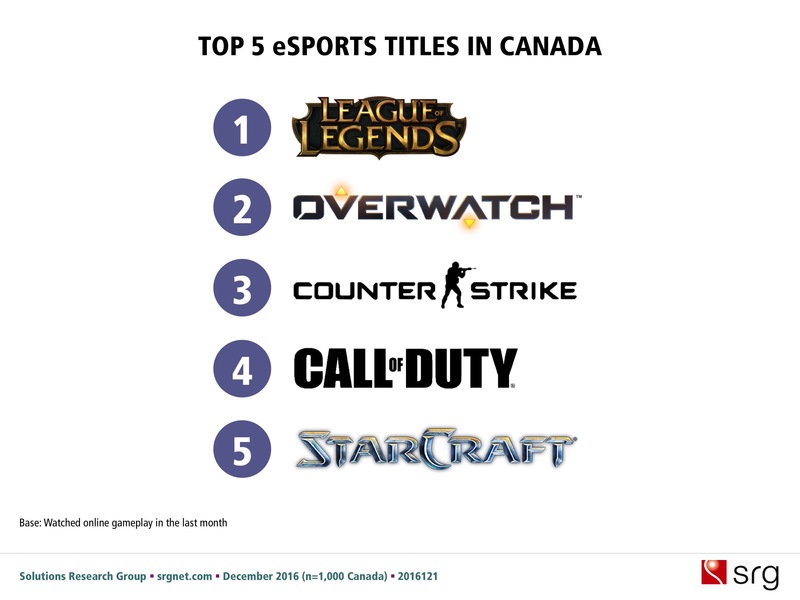 League of Legends, Overwatch and Counter Strike are the most popular eSports titles in Canada. One confusing thing: popular definitions of eSports does not yet quite include well-liked ‘sports’ titles produced by the likes of Take Two Interactive, 2K (e.g., NBA and NHL 2K etc.). But there are signs this will soon change as 17 NBA teams are set to take part in inaugural NBA 2K eSports league in 2018.
eSports are a booming subset of the growing online gaming culture. Nearly half of online Canadians – including 60% of people aged 12-29 and 37% of people 50+ – say that they have played either a single or multiplayer game on the Internet.